In this Feb. 15, 2018, file photo, Rep. Adam Schiff (D-CA), Ranking Member on the House Intelligence Committee, speaks with reporters on Capitol Hill in Washington, DC. 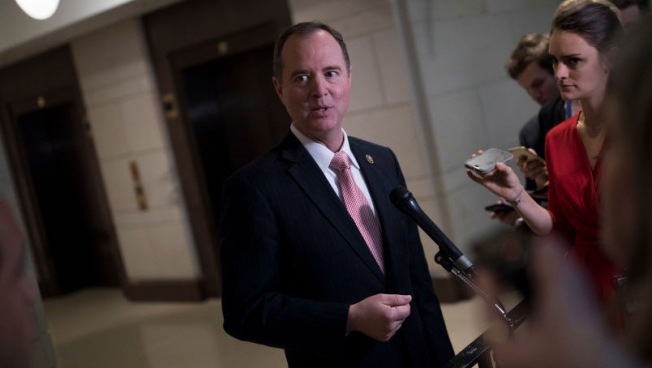 President Donald Trump is name-calling Democratic Rep. Adam Schiff for saying Matthew Whitaker's appointment as acting attorney general is unconstitutional. Trump says Schiff shouldn't complain that Whitaker wasn't confirmed by the Senate because neither was special counsel Robert Mueller, who's investigating 2016 election interference and possible ties between Moscow and Trump's campaign. Critics contend Trump illegally sidestepped procedure by appointing Whitaker over Deputy Attorney General Rod Rosenstein, who's been confirmed. Trump's tweet calls Schiff "little Adam Schitt." Schiff's response: "That's a good one. Was that like your answers to Mr. Mueller's questions, or did you write this one yourself?" Trump on Friday claimed that he, not his lawyers, wrote answers to questions from Mueller. Trump says he'll submit them soon to Mueller's team.